Halo Jones is back (yay!) although it’s Book Three and, as all old school readers of 2000 AD should know, this is her last story (boo!). We’re only up to episode two (three if you count the prologue) and already ten years has passed since the events in Book Two and Halo has joined the army. She had spent the last decade drifting from job to job and she started this book as a directionless, unemployed drunk in a bar. She only really joined the military because her tall friend Toy was amongst the recruitment people that visited the town she was hung over in. It doesn’t seem a good enough motive to me but people in real life have joined the army for less sensible reasons than that so who am I to judge? In the Nerve Centre, a letter from Earthlet Robert Stanier explains how a friend of his is saving his collection of the first one hundred progs to give to his three year old daughter on her twenty first birthday. Now that it is 2008 and she must be well into her twenties by now I find myself wondering how did she like her birthday present, how much did she got for it all on eBay and has she appeared on The Jeremy Kyle Show yet. 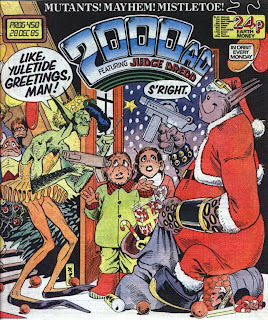 Even if 2000 AD publishers IPC seem to be unable to accept that they have a hit on their hands at least those close to the comic, for example the editorial staff as represented by Tharg, understand that a good way to celebrate Christmas is to run an extra long Judge Dredd story. In A Merry Tale of the Christmas Angel, Judges send a food convoy to the mutants outside the West Wall, a freshly lobotomised Mean Machine Angel spends the day with a timid, middle aged couple and some guy with issues about the festive season goes on a shooting spree at a nativity play. If I were to say to you that this tale’s “Scrooge” has a Mohican hairstyle, who would you say draws the thrill? The answer is, of course, Steve Dillon, although I would have considered “Brett Ewins” a reasonable guess. This story serves as a perfect example of what great writers Wagner and Grant are. Each thread is entertaining in its own right but, by the end, they collide together in a perfect and utterly satisfying way. This prog's Rogue Trooper strip ends, mid story, with the announcement that the thrill will return in the New Year. This seems to be happening a lot recently; first Mean Team and now this. 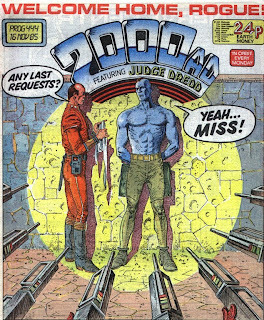 At the height of it's popularity, all that seemed to happen in the thrill is that Rogue Trooper marched around Nu Earth looking for The Traitor General and experiencing grim and, on the whole, humourless adventures. Now, it feels like, ever since finding the traitor, every new story is an event. This time, Rogue and his bio-chip buddies return to Milli-Com to witness The Souther and Nort brass signing a peace treaty. How did this happen? Where was the foreshadowing to this? It wasn't that long ago the very idea of a Nort was enough to send a Souther officer into a battle rage; now they're best friends? The good news is that there is a mysterious alien race who have united the old enemies against them and, even better, have had to base themselves on Nu Earth so that they can travel through the nearby black hole once the space storms have passed. The new aliens have teleportation technology which means every episode over the last few weeks has seen them suddenly appear from nowhere and cause disruption before disappearing again. Helm, Gunner and Bagman are about to be regened when, suddenly, the aliens appear, grab the geneticists and vanish. The Nort and the South top brass are about to have a peace treaty party when, suddenly, the aliens appear, knock over the jelly and ice cream, steal the pass-the-parcel parcel and vanish. Rogue is about to settle down for a relaxing, hot bath at the end of a hard day trudging around Nu Earth when the aliens suddenly appear, swap the hot water for ice cubes, cover the bar of soap with itching powder and then vanish. Damn those pesky aliens. Slaine returns this prog (yay!) far sooner than I had expected. The cast spend this episode deciding what to do about the awakening Dark God, Grimnismal, and The Cythron Girl. The Cythron Girl spent the end of the last Slaine run parading around with Nest on a lead and referring to her as a sow to be experimented on. Now she is pleading for her life saying "I can help you" to which Slaine replies, "How? By killing yourself?". All I feel able to contribute to this debate is, great body, shame about the face. Slaine returns with extras; a role playing game, instructions for which are going to be serialised along side the strip over the coming weeks. Role playing games have never been my thing and at this time, in 1985, I can say with almost complete confidence that I despised them. This is because during the sixth form, I managed to strike up a conversation with a girl in my year that I fancied when it was interrupted by a roll playing game obsessive I knew telling us that the previous night he had stepped on an elf's eyes. "One went squelch and the other went pop." She ended up going out with an older boy called "Paul Rainbow". Anyway, I'm normally very happy to read anything that appears in 2000 AD for The Slog but, on this occasion, I hope you don't mind if I skip this bit. Meanwhile, this prog's episode of Mean Team ends after only three pages with an announcement that it will return in the Spring. As a thrill, it's not fallen into place yet while Bellardineli's art looks hurried compared to usual. I think he, with Wagner and Grant, have decided to do another ACE Trucking Co story instead which seems a better use of everyone's time. We have seen in the thrill, however, an appearance by a puppet as a sports commentator which, in case you didn't know, turns out to be an early version of the Bat Man villain Wagner and Grant go on to create, Scarface and The Ventriloquist. Nemesis Book Five stops for a little break after this prog. It ends this episode with Nemesis, Torquemada and the ABC Warriors entering the Time Wastes to stop Thoth from destroying the galaxy by forcing the black and white holes that exist either side of Termight to collide. Torquemada's wife, Candida, and alien loving Purity Brown are also present. It should be noted that Bryan Talbot, the art robot with the loveliest hair in comics, is drawing them both with big, Goth style Barnets as was the fashion in 1985 and again in 2008 and whatever year this story is set in. Judge Dredd has been experiencing a memorable run of self contained one offs recently. It's as if script robots John Wagner and Alan Grant are compensating readers for the disappointing, multi part epic City of The Dammed. In this prog's tale, hundreds of citizens jump silently to their deaths from the top of Flakey Foont block. The story ends with the Judges concluding, after a lengthy investigation, that no criminal act was responsible for the deaths but was, in fact, a case of mass hysteria brought on by modern living. I can't remember how I felt reading this in 1985, at the time Milton Keynes, apart from being Europe's largest mutie ghetto, also happened to have the country's highest suicide rate, but in 2008, probably because of recent events in Wales, I find it quite bleak. Sam Slade Robo-Hunter Farewell my Billions ends this prog. After fifty years spent in rehab, Sam is an old man again and on the hunt for Hoagy and Stogie, his two idiot droids who are gambling away his 27 billion credits in savings. The story ends with Sam having no choice but to go back into the robo-hunting business and Hoagy and Stogie for sale in a second hand shop. If my memory is correct (here we go again), this is the last Robo-Hunter story from the classic era. After Farewell my Billions we don’t see Sam again until he returns written by Mark Millar several years later. Every 2000 AD reader of my age has an opinion on these stories but, of course, I’m not going to express mine until I encounter them again during The Slog later. In Judge Dredd Death of a Politician, Mayor Dave the Orang-Utan and his owner, Billy Smairt, are stabbed to death by assassins outside their favourite bar, Salmonella’s. As you know, I loved the story Portrait of a Politician where Dave became mayor and now, here he is, lying dead in the street with a knife in his back. It was a tragedy the first time I read it and it’s a tragedy again. I haven’t anything more to say on the matter other than I didn’t want Dave and Billy’s deaths to pass by without them being commemorated. I think I may have been slightly dismissive of Peter Milligan's Future Shock stories in recent entries. The problem with anyone who replaces Alan Moore as the new definitive script robot is that they are going to seem, initially, like a disappointment. Very quickly, Moore established himself as popular amongst the vocal comic fan community and any astute editor would know that, given this, you allow someone with that regard as much movement within the constraints of the format of a Future Shock as possible. If Moore wants to use a reoccurring character then fine. If he wants the centre, colour spread then that's no problem either. Milligan's Future Shocks are more traditional; written, perhaps deliberately, as if Alan Moore had never existed. This prog's, Doing Time, drawn by Robin Smith is pulled from the tabloid headlines of the day. Two young men take delight in committing crimes because the punishment when they are caught seems light. The strip ends with them being sent back in time to today, 1985, making crime "a thing of the past". It's just a daft, contemporary idea given a pop sci-fi spin but seems more in tone with Future Shocks from before Alan Moore. A better example is last prog's, Prisoner of Conscience. The reveal is a half page panel, which is a formatting trend that happened often in earlier Future Shocks (although on this occasion, the twist is run on the right hand page totally dampening the surprise). A reveal like this is more effective normally but it does make any possible collection of Milligan Future Shocks less likely because lots of half pages in a book is less aesthetically pleasing to the browser. 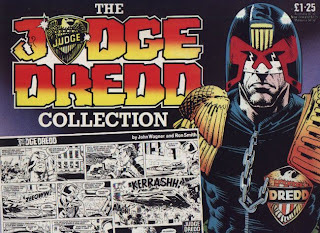 On the subject of past masters whose presence is still felt, the back colour page has been used recently to print art from the covers of Judge Dredd Eagle Comics drawn by Brian Bolland. 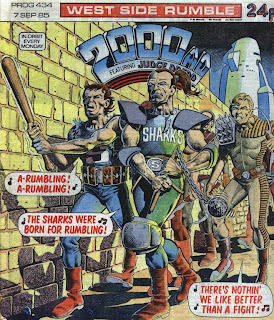 This series of pin-ups is titled The History of Justice, as if the work was commissioned directly by Tharg. Personally, I have a fondness for the artwork being printed in this manner. Yes, the paper is cheap newsprint and the ink comes off onto you fingers but the size is bigger and the artwork all the more striking for it. John Wagner and Alan Grant's writing pseudonyms are becoming characters surrounded by pre-publicity in their own right now. Milton "The Beast" Shrimpton appeared in a Tharg story a few progs back before the start of Mean Team an issue later. In it, a new script robot is delivered to the Command Module only, instead of being the tough, no nonsense creator droid that they were expecting, he turned out to be the effeminate and very, very camp Nigel. "The Beast" waved at the other creator droids from his delivery crate shouting "coo-ee!" and minced around the office skipping with a daisy chain for a rope. Disappointingly, there had been a mistake made by the Post Office. This droid was meant for toddlers' comic Jack And Jill. When the real Milton "The Beast" Shrimpton arrived, he got straight to work writing The Mean Team to sound effects such as "hack", "slash" and "grind". The Mean Team is another future sport strip with casualties. A cross between Inferno and Blackhawk, which might explain why Bellardinelli got the gig drawing it what with having been the principle artist on those two thrills before. There's also an unhealthy dollop of The Mean Arena in there too. Those of you who have been following The Slog for a while will know that I found what felt like the never ending presence of The Mean Arena a bit depressing. Personally, the portrayal of the robot revealed as the real Milton "The Beast" Shrimpton is so off putting that, coupled with my natural aversion to sport, future or otherwise, I find myself resistant to The Mean Team. Of course, it is early days and the thrill is just getting warmed up, plus it is being written for real by the usually excellent Wagner and Grant, but I can't help thinking how much more fun the strip would be if it had been written by Nigel in the end. So far, Nemesis Book Five, currently up to episode three, is proving to be the closest 2000 AD has got to a multi-thrill cross over. 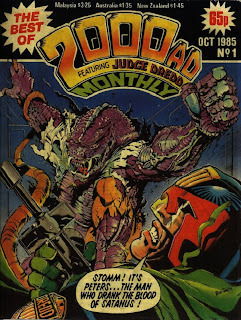 Already we've seen Ro-Jaws from Ro-Busters, a reference to the ABC Warriors, a Judge pulled forward through time from Mega City One and Satanus... again! What is it with Pat Mills and Satanus? Every thrill he writes eventually features an appearance by the insatiable tyrannosaurus rex or one of his relatives at some point or other. Last prog, during their wedding, Magna dropped her psychic guard for a moment and Nemesis learned that she had murdered his last wife and left his son for dead at the end of Book Three. Understandably, Nemesis killed her instantly with his sword. If you ask me, if you have to carry a sword to your own wedding then you probably don't trust your bride enough to marry her in the first place. Personally, I don't think that Magna was that bad; earlier, she gobbled up Grobbendonk whole when Nemesis' back was turned. Grobbendonk has been irritating me ever since he got the gig as Nemesis' familiar during Book One. If memory serves me correctly, the panel where Magna is killed was "censored" for publication. Art Robot Brian Talbot originally drew it containing fountains of blood but the excuse that Magna is an alien and, therefore, that isn't really blood didn't cut it this time and somebody high up in the chain had somebody else lower down apply some tip-ex. Meanwhile, slow moving IPC, the publishers of 2000 AD, are at last taking advantage of the growing readership and old material by publishing the Best of 2000 AD Monthly as advertised this prog. 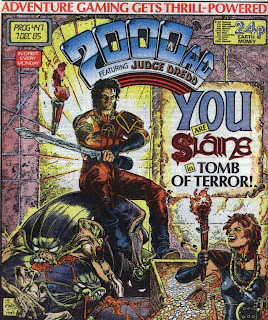 Issue one runs the Judge Dredd strip Blood of Satanus (him again!) which recently appeared in the US styled monthly reprint comic and has remained in print thanks to The Chronicle collections, both published by Titan. IPC seem to respond to trends nearly as quickly as the Roman Catholic Church. 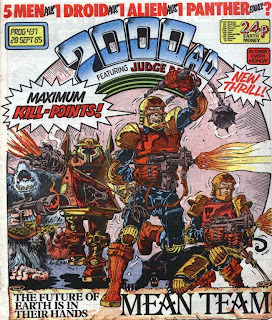 Art Robot Belardinelli produces the cover to this year's 2000 AD Annual. I don't know about you but I find it a little disconcerting learning that Ace from ACE Trucking Co is a similar height to the heroic looking Judge Dredd, Johnny Alpha and Rogue Trooper. I had always imagined he was shorter for some reason. In Strontium Dog, Johnny and Wulf go on a job to my home town of Milton Keynes. They are already big names here thanks to a job they did previously in Prog 189 which, worryingly, I have no recollection of whatsoever. (Make a special note if you're a Slog reader interested in any medical effects it might be having on me). The story ends with Johnny doing their bounty a favour and faking their death so that his information is removed from the Dog House wanted database. Wulf remarks, "A favour? Leaving him to live in der hell hole like Milton Keynes?" Of course, as this was written and drawn before the opening of The Theatre District and The Snow Dome he wouldn't say that now. It has become customary for both annuals to be padded out with reprints of Judge Dredd strips from The Daily Star. One of these is a nine panel representation of The Apocalypse War that ran for twenty five weeks when originally serialised in the weekly comic. This is such a perfect example of contraction that it borders on beauty; just steps always from being a comic strip version of Haiku poetry. In Dredd's annual, two of the reprinted Daily Star strips seem to be contracted retellings of the longer colour originals, printed here for the first time. 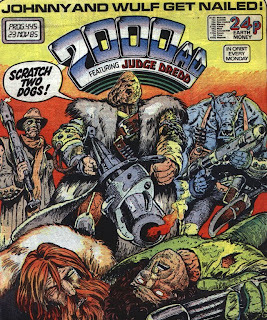 Carlos Ezquerra looks like he was in a bit of a hurry producing the colour art for this year's Judge Dredd Annual. He still fails to produce it all and the final strip is air brushed by John Higgins. 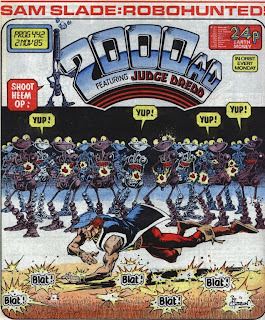 This year's Judge Anderson strip proves confusing to me because its credited as a Judge Dredd strip. I read it expecting Dredd to pop up at any moment but he doesn't. Slaine's big adventure as a time warrior ends this prog. I say "ends" but the final panel of this episode has Myrddin announcing that Grimnismal, the worst of The Dark Gods, is awakening from his slumber. Thanks for ruining the party, Myrddin. Previously, when I wrote about this epic, I confessed to finding it difficult to follow but, in the end, I would say that I caught up with it pretty well. At the beginning, script robot Pat Mills spends a lot of time throwing new, brain bending concepts at us but, later, he seems to have lightened up a bit, letting his ideas leak into the story in the concise but accessable way that I normally associate with his writing style. This Slaine saga is drawn by two art robots, David Pugh and Glen Fabry, who alternate runs between them. History tells us that Fabry is the star here, but his work in early episodes looks like enthusiastic fan art to me. It seems like he's drawing the Celtic warrior as a superhero who spends hours doing his hear before going into battle. But by the final episodes, his work looks amazing. The characters ooze personality and emotion, his ink work is considered and his overall style radiates confidence. Fabry seems to be the spiritual successor to the already legendary Brian Bolland. More so than Cliff Robinson, anyway. However, the moment I saw David Pugh's first warp spasm I realised that, of the two on this story, he is the art robot for me. Slaine, almost bursting out of his own skin, snaps a chariot shaft in half and cuts his way through an army of Vikings with its sickle blades. More recently, Pugh draws two full pages of ancient, claustrophobic architecture which, we learn, are the buildings that imprison The Dark Gods. These pages are stunning. As good as Fabry is by the end, it's Pugh's work that, first time around, eroded my resistance to the new boys because they weren't Mike McMahon. Rogue Trooper's visit to Horst turns out to have been relatively brief. Already, he has found the antigen that will enable his bio-chip buddies to be re-gened and is on his way back to Milli-Com to face the consequences of disobeying orders. Once again, Rogue ends a story imagining himself standing together with his GI brothers, Gunner, Helm and Bagman, as whole men with their shirts off. 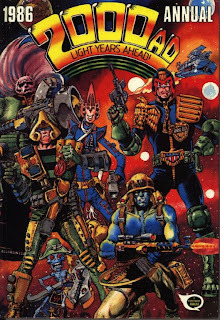 I think we all understood that Rogue couldn't spend the rest of his time in 2000 AD searching for the Traitor General but relocating him from Nu Earth doesn't seem to have been a wise move considering that the planet functioned as a major character in the thrill itself. It's not just in Rogue Trooper that there is a sense of these being its final days. In ACE Trucking Co, Ace has been given only days to live and has decided to take part in a race to Poopoopeedoo where, once again, he has wagered his entire trucking business on winning. Once again, art robot Belardinelli draws himself in, this time as an overweight pirate. What makes his cameo different on this occasion is that the characters name is Belardi leading me to think that it has been written in by Wagner and Grant. In Judge Dredd Nosferatu, written as usual by Wagner and Grant, Mega City law enforcement is on the hunt for a spider like murderer who kills his victims by liquefying their insides and drinking the contents through puncture holes in the neck. Lovely. The great thing about Judge Dredd is that, conceptually, it's scope is broad and strong enough to handle a genuinely creepy tale as this as well as the political satire, big adventure and outrageous violence that we already know it for. Every year, the Sci-Fi Special seems to get taller. By 1997, I fully expect it to be the shape of a 24 inch ruler. The paper is shinier too. According to my memory, which, as we all know, isn't entirely reliable, the paper the specials now use is similar to that used by magazines that came free with Sunday newspapers at the time. Inside, Cam Kennedy draws Judge Dredd again. Yay! Neither party involved in this relationship between artist, character and reader is getting bored yet. In fact, Kennedy works well with the taller paper bleeding off page here, there and everywhere. For the Future Shock, Script Robot Peter Milligan works with Art Robot Brendan McCarthy. It's a creative partnership that goes on to be very influential in comics. Outside of 2000 AD at this time, they might be creating vital comics, however, in Do You Copy, we are given a perfectly enjoyable Future Shock but nothing particularly memorable story or art wise. The final DR and Quinch story by Alans Moore and Davis is here also. It really is a wonderful and a flawless way to wrap up the thrill that the creator droids have decided never to do again. I'm trying to forget about the single paged, agony columns the characters go on to host a couple of years later. Every now and then there is a Strontium Dog story that gets my ire up and has be shouting at the page, "Get him, Johnny! Shoot his legs off!" Slavers of Drule, currently running, is one of them. In it, a reservation of nice, honest, hard working folk on Smiley's World are attacked, abducted and sold into slavery elsewhere in the galaxy. The police don't hold much hope of locating any of the victims so decide not to bother looking but Johnny Alpha with his norm partner Wulf, moved by the plight of one family in particular, is tracking them down for free. I can't wait until they successfully make all guilty parties involved in the chain pay. "Hit him, Wulf! Hit him with your hammer until he is as dead as der cucumber!" The bad guy in the current Judge Dredd story, The Midnight Surfer, is Judge Dredd. All Marlon Shakespeare AKA Chopper AKA The Midnight Surfer wants to do is take part in Supersurf 7. Unfortunately, Supersurf 7 is illegal in Mega City One and the Judges are determined to ensure that it doesn't take place. If this means shooting foreigners off of their skyboards then so be it. In Dredd's defence, Supersurf 7 has caused disruption in Mega City One resulting in property damage and death but, on the other hand, the morale that Chopper's win has had locally is immense. I remember Song of the Surfer being a surprise at the time. Not just because Dredd is portrayed most overtly so far as the villain but also because his appearances are kept to a minimum. Cam Kennedy's Dredd art is, once again, brilliant to look at and Wagner and Grant's script is, once again, beautifully paced. It's a wonderful example of script and art working in unison and exceeding the sum of its parts. 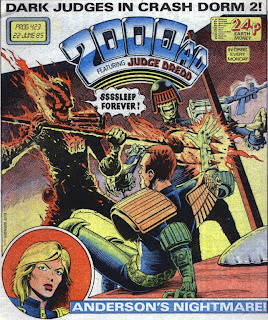 Judge Anderson's first, big solo adventure finishes this prog with thousands dead, the Dark Judges stranded in a random dimension and her suspension lifted. It turn's out that, being a psi, she was prone to influence from Judge Death and therefore not in control of her actions. I'm still surprised that she got let off the hook when you consider the things people do get arrested for in Mega City One; for example, I saw a guy get busted once for whistling in a humming zone. When I wrote my entry for Prog 422, it was with the incorrect memory that Brett Ewins draws the entire story. I had completely forgotten that he is replaced half way through by art editor robot, Robin Smith, and Cliff Robinson. 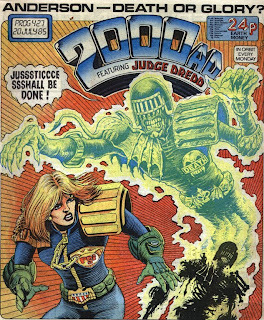 As Brian Bolland's number one fan, Robinson's presence partly undermines by point that Ewins serves as a bridge between the old and the new artists to draw Anderson and The Dark Judges. Fortunately, Smith's style is far enough removed from Bolland's that I don't feel entirely stupid by what I said the other day. I joke about the influence that Bolland's work has had on Robinson's but I can't deny my sense of awe at the staggering discipline he displays in his inking. In general, I ink my comic strips with a brush and I find that I am frequently frustrated by how it splays or my line looking that it's been applied by somebody with Parkinson's Disease. Robinson's ink work looks like it's been applied by a, well, robot. Sometimes, I'm so mesmerised by it that I want to lick the page. 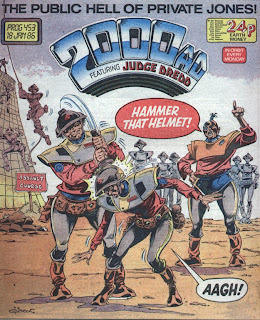 The line of 2000 AD re-prints continues to expand as, this prog, there is an advertisement for "The Judge Dredd Collection", a book containing the first run of Saturday strips from The Daily Star. It makes a nice change to see that IPC, the publishers of the weekly, have had the foresight to produce this collection and not, for example, the rapidly growing Titan Books who repackage everything else. 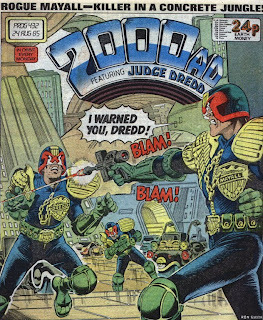 The Daily Star Judge Dredd strip began three years before in 1982 and is great. Approximately nine panels long, each episode is a self contained, tightly scripted, concentrated hit of Judge Dredd goodness. Ron Smith draws the strip for years making him, in many people's minds, the definitive Judge Dredd artist, I'm sure. Each episode is beautiful to behold. 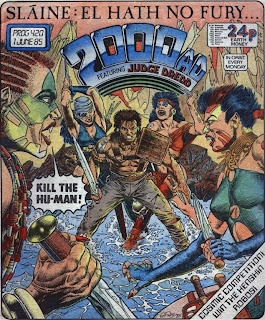 Interestingly, John Wagner is credited as writer by his real name which, at the time, I interpreted, probably incorrectly, as him taking greater pride in his work for the newspaper than for 2000 AD. Over twenty years later, I'm amazed that this arrangement between The Daily Star and 2000 AD ever happened. Not because a British newspaper ran what is essentially a strip for boys at a time when, broadly, comics were seen as being read by either children or illiterates but because the paper had the insight to run it in the first place. Look at the Daily Star in 2008 and it's hard to imagine their journalists having to do anything other than watch Big Brother and write copy to accompany photographs of poorly educated young women. If the paper was essentially the same in 1985, how did something as finely crafted as the Judge Dredd strip manage to get commissioned at all? 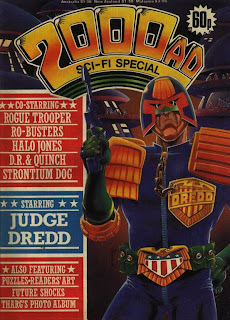 After careful consideration, I have decided not to include the series of Judge Dredd Collections as part of The Slog. However, I would like to take this opportunity to suggest that Rebellion, the owners of 2000 AD in 2008, consider repackaging the strips from The Daily Star in a format similar to the recent Peanuts collections published by Fantagraphics. That would be great. Something that has always impressed me about 2000 AD is how certain characters and ideas popular with the readers are often under exposed, particularly when you compare them to their American equivalents. Mainstream American publishers flog a success until every last drop of goodness has been wrung from it, then they keep on going until even the dumbest of us start to feel embarrassed and then we learn that this is just the start of that character's exposure. I say this because even though Judge Anderson has been very popular since she first appeared around prog 150 she's only featured in the Judge Death sequel, a handful of one-off shorts for the Annuals and as support in the City of the Damned since. Okay, written down like that, it seems a lot but when you think that she could easily have been used as a permanent sidekick to Dredd then you'll agree that the editorial and creators involved have demonstrated great restraint in reserving her first solo appearance in the weekly until now. In her first big solo adventure, Anderson has been duped into providing access to Mega City One to The Dark Judges again. While they go on a killing spree, Anderson is confined to quarters for being stupid enough to help Death and his friends across from Deadworld in the first place. Wagner and Grant script this yarn which, in an earlier episode, features the classic exclamation from a potential elderly victim of Death; "Dodder for it!". The real achievement on Judge Anderson is art robot Brett Ewins tackling the strip in the first place. If Anderson has been used sparingly before now then The Four Dark Judges have been used even less. 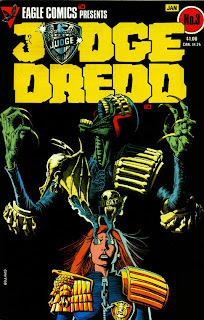 Previously, their appearances had been drawn by classic Dredd artist Brian Bolland, and seen by many as the panicle of his work on the character. For this thrill, Ewins pays tribute to him by sprinkling redrawn classic frames throughout his version but mashing it up with his own story telling interests at the time, such as repeat copies of his own panels for dramatic impact. I see Ewins as the bridge between the previously thought of as untouchable version by Bolland and all of the artists who go on to draw these characters after him. Since his return to 2000 AD several weeks ago, Slaine has been performing missions up and down history which involves him fighting creatures from timelines that exist between our moments. Already he's led the Celtic Forces in battle against the Viking Army led by the changling Elfric, fought the time worm Crom Cruach and chopped up some El women who, upon their deaths, reverted back to their true slug-like forms. Yuk. Watching all of this on a big, Star Ship Enterprise styled screen from the Time Fortress are Ukko the Dwarf, Nest, Myrddin a.k.a. Merlin the magician-in-a-body-stocking and a bunch of other guys wearing crazy masks. If from the above you think I understand what is going on then I'm afraid to admit that this isn't always the case. On Slaine's returned, script robot Pat Mills has decided to add a significant amount of new concept to the thrill turning it from an accessible but well researched sword and sorcery strip into, well, some kind of surrealist's ride on a runaway school bus. I'm reading a couple of episodes a day for The Slog and I find myself still occasionally scratching my head and trying to work out what's going on. How did we manage a week between episodes first time around? Bizarrely, the thrill that needs it the most has decided to dispense with recapping the story so far altogether. Even my memory isn't so bad that I usually forget what I have read earlier that day but I was relying on the recap giving me some sort of confirmation that what I think is happening is what is supposed to be happening. Interestingly to me, the themes being dealt with here are similar to those that Grant Morrison and Alan Moore deal with later in The Invisibles, Seven Soldiers and Promethea. 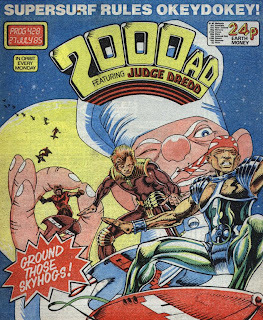 In 1985, 2000 AD is still thought of as a comic for boys available for them or their parents to buy for them from most newsagents in the country to read and throw away later. It is not a high production limited series by well paid creators that, let's face it, is produced with the intention to be kept in print for decades to come.